The number of passengers travelling through Dubai International Airport (DXB) is increasing each year and is now in excess of 50 million. Dubai Airport is sited around 5 km / 3 miles south-east of the city and is one of the premier airports in the United Arab Emirates and throughout the Middle East, boasting a multitude of facilities and services for visitors. Two terminal buildings handle most of the traffic arriving and departing at Dubai Airport and are connected by repeated shuttles. Both Terminal 2 and Terminal 1, also called Sheikh Rashid, handle arrivals and departures. Al Majlis or the VIP terminal building handles private jets and VIP guests. The city's very own Emirates is the main airline at Dubai Airport and connects some 90 different destinations, having won more than 300 different awards for excellence over the years. Various ground transportation options from Dubai International Airport (DXB) link the city centre, Dubai Marina and Jumeirah Beach. Buses, limousines and taxis await each arrival, while many regional accommodation providers can arrange complimentary airport pick-up and drop-off services. Those wishing to have the convenience of their own transportation can arrange to hire a car from one of several major car rental agencies represented at the airport. 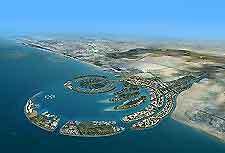 Nearby, the port town of Mina Jabal Ali and the wealthy city of Abu Dhabi is connected to Dubai Airport by the D-11. Dubai is one of the most popular tourist destinations in the Middle East and is very much a city of the future. With first-class hotels, spectacular resorts, artificial palm-shaped islands, a variety of different attractions, beautiful mosques to explore and a sunny climate, Dubai makes a great place for a vacation. Those flying into nearby Dubai Airport (DXB) will soon realise that the city is also known as the 'shopping capital of the Middle East' and is home to retailers with a variety of merchandise, from high-fashion and gold and jewellery to carpets, handicrafts, electronics and more. Visitors can shop at any number of places throughout the city, such as shopping malls, huge outdoor markets or at duty-free outlets.